I'm still riding that post-relay high today, much better than post-race high if you ask me! 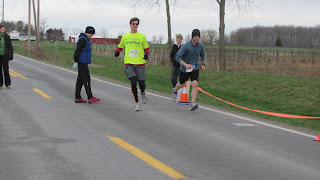 Last year I broke this race up into three posts and I am going to do the same thing again this year, but I'll actually run during the first part this time! My parents got into town on Friday night and we watched how the manhunt was going in Boston, and we were all relieved when they finally got the guy alive. Saturday we went out to brunch at Jines and then we just hung out, dropped Bernie off for boarding and had dinner with two of our teammates Sarah and Mark. Sunday morning we were up early to get to Geneva to pick up our race packets and get ready for our 8am wave start time. We got there just as the 7am wave was taking off, and there were a lot of runners hanging out at the start. First wave, 7am, taking off! Our team started to arrive and then our lovely driver for the day, Cat, got there after I picked up our stuff. 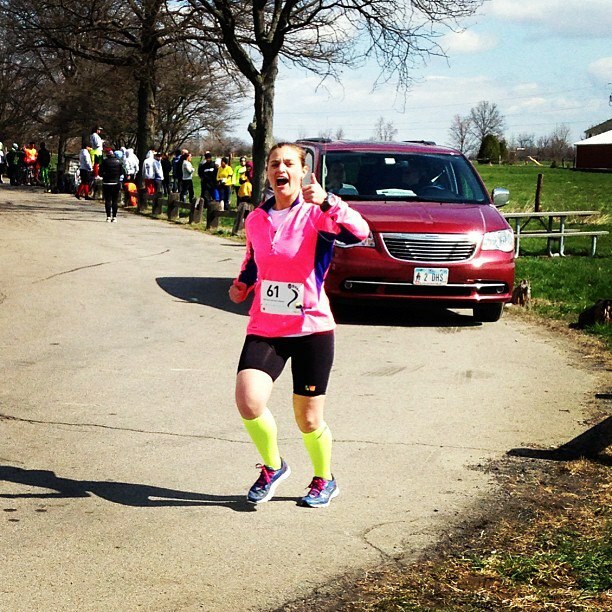 Cat was on our team last year, but unfortunately she was injured this year and couldn't run. She still wanted to be a part of the day and she volunteered to drive us around all day, so amazing! Sole Sisters and their Misters and honorary teammate! 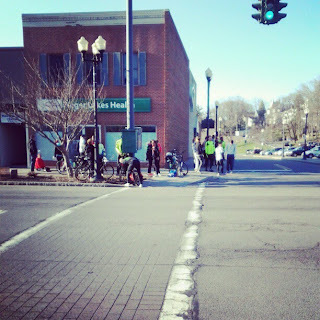 My mom was our first runner and as it got closer to the start, she made her way with the rest of the runners down Linden Street. 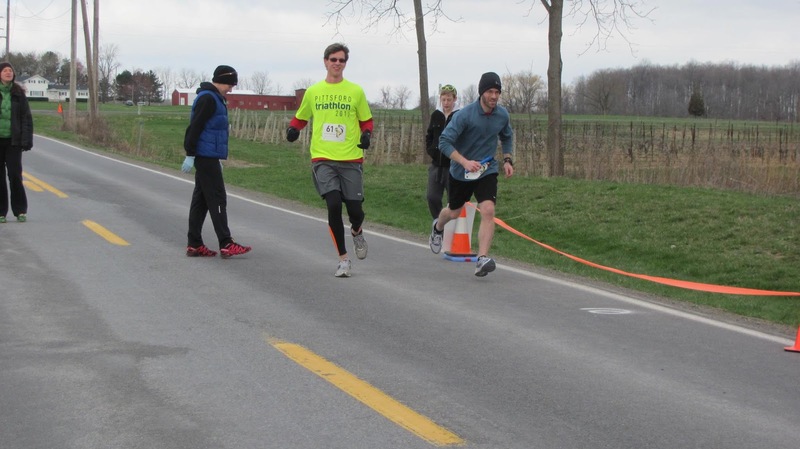 After a brief countdown, the runners were off and starting our 77.7 mile trek around Seneca Lake! Our team hopped into the van, with my dad there as well as our team cheerleader, and Sarah (our second runner) got on the shuttle. When we got to the second exchange point, we just hung out, used the bathrooms and waited for Sarah to get there. As the day went on, we realized we had a chance this year to be a little bit more competitive than last year. We were all running strong and we were catching up to some of the 7:00am and 7:30am starters. Mike and I saw our friend, Heather, and it was fun to see everyone having a good time (at least it looked like it to me). Look at those determined faces! Our friends Amber and Greg said that they were going to come spectate and right before it was Mike's turn to starting running (he was runner 5 of 7) we heard that they were almost there. Our team kept making our way around the lake and running fast! Paul flew, literally, all day! Right around 10am it was Mike's turn to run his first leg! I learned my lesson from last year, to go to the bathroom as much as possible since there aren't always port-a-potties available and I thought I was doing a good job of doing just that. We got to my exchange point and the line for the port-a-potties was LOOOONG! I was a little worried and then finally decided to just cut everyone, asking first of course, and they agreed (a little begrudgingly though). Run around a lake all day? Yes, please! Good thing because as soon as I got to the slap bracelet hand off point, Mike was coming in! My dad would signal to us that our runner was coming and I could see him waving a few minutes after I got to the exchange point. Mike came running in, after a first speedy leg of 3.8 miles at 7:32 pace, and I took off! I ran by the line for the port-a-potties and people who had originally been in front of me were still in line, I gave them a thumbs up and said thanks for letting me cut and ran on my merry way. My first leg was 4.6 miles that was described as "incremental downhill", but I would say that there were some rollers in there. As soon as I took off, I caught one of the female runners that had taken off right before me. Soon after I caught the other one, which was a good feeling because last year I didn't catch many or any runners at all. My first mile came in at 7:47 and I got slightly worried, I only ever run sub-8 minute pace at the beginning of 5Ks and then slowly die. I knew that there were going to be nice rollers so I just kept pushing. I think I was passed at one point by one of the fast teams, you could just tell, but I had some people in my sights that I could catch. 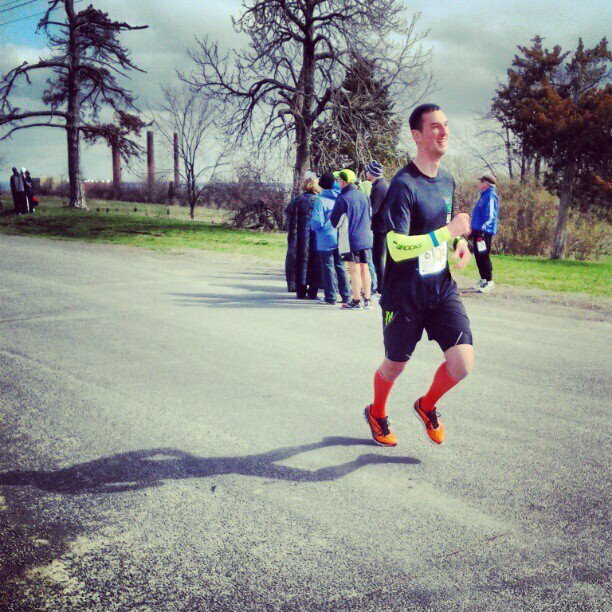 Also at one point this guy and I were running together for awhile, he helped push me! My second mile came in at 8:13 pace and I felt great! 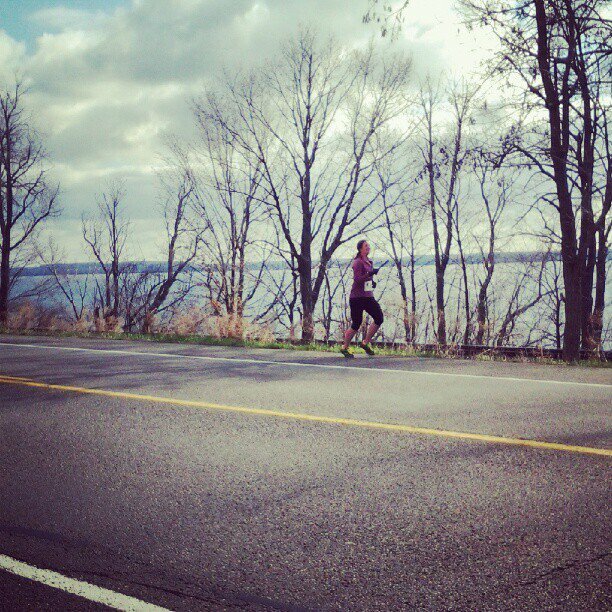 I kept taking in the gorgeous views, the vineyards, the lake, and just appreciating the fact that I can run. There were a lot of people wearing blue and yellow, shirts that honored the victims of the Boston Marathon bombing and ribbons (our team had on blue and yellow ribbons that Jenny made). I started to wonder if I could keep up the pace when the third mile came in at 8:12 pace and I just kept pushing, the guy that I had been running with got ahead of me slightly on one of the hills and I just tried to catch him. 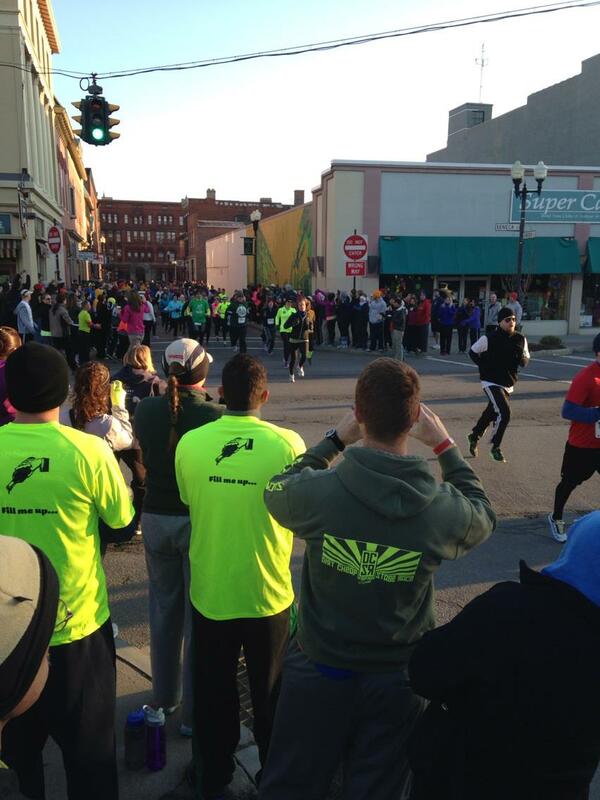 One of the negatives of this leg was that you could see the exchange point for over a mile before you got there! My fourth mile came in at 8:13 and after going up a slight hill, it was all downhill from there. I saw my dad in the distance and the people at the exchange point. I passed some volunteers directing us and they said that we were almost there, the guy was still right in front of me - I never did catch him though I tried, and I pushed it as hard as I could. I got to Jenny and handed her the slap bracelet. According to my watch I ran my last .55 miles at 7:38 pace for a total time of 36:38. I was pumped! Jenny was running, and we took off to get my mom to the exchange point for her next leg. Which is where I will start off tomorrow! Wow speedy. I feel like I am flying anytime I get close to 9:00. I cannot imagine running sub 8 anything. I bet you looked so FAST! your run sounds great! Ahhh, all those pictures of downtown Geneva make me miss it so much! (And I also can't believe it's been one year since the first Seneca7--crazy!) Good call with the port-a-potties too. Can't wait to read part two! Oh, did you hit up the trail mix bar? It was epic last year. We didn't, I think that was at packet pickup on Saturday only. Since it is an hour drive away we just went on Sunday. Speedy girl!!!! It looks like you had a fabulous time! You are a relay machine! Can't wait to hear more. You totally make me want to do a relay. I really have to find one. Such a fun experience! Glad the porta-pottie thing worked out. Way to knock out great splits. Jealous as I am a slow as sh** runner (aka jogger at best). Love that it was a family affair too. I forget how young you are to have such a young and fit mom! Can't wait to read the rest! I want to do a relay with you more than anything!!!! I love this recap. You are rapidly becoming speedier Jamie. I'm so proud of you. I hate the setbacks all these injuries have caused me but I all your posts make me want to keep on churning and trying hard to be awesome like you. You've gotten so fast this past year Jamie! That's not my imagination, right? !